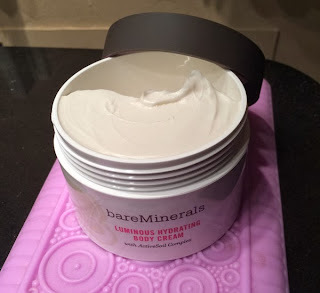 THE SKINNY: Winter skin won't be able to stand up to the new Bare Minerals Luminous Hydrating Body Cream. This super-thick and hydrating cream is keeping my skin in check now that the air has gotten dry. I wish this product had come out years ago. It is thick -- really thick. You can turn the jar upside down and not a drop would fall. But it's not cakey and applies easily. Plus the cream contains tiny gold speaks for a finish that glows. Plus a little goes a long way. So even though it seems expensive, you'll be using one container for quite a while. CHECK IT OUT: You can buy Bare Minerals Luminous Hydrating Body Cream direct from the company or at retailer such as Sephora.